Today was another first for the guys: their first trip to New Jersey! Everyone remembers their first trip to New Jersey. The stench of the Garden State often lingers in the nostrils long after the first visit. After time this generally fades as olfactory fatigue sets in and then trips to New Jersey become a bit more tolerable. 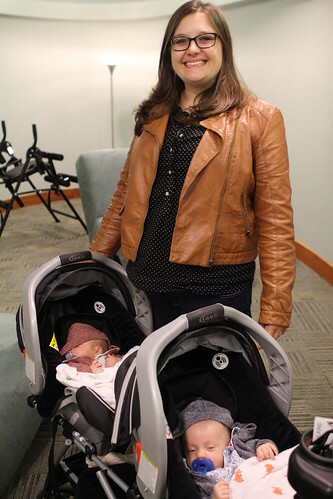 It's a little strange taking your small babies to work and then changing their diapers but they seemed to enjoy it or, at least enjoyed it as much as they enjoy a diaper change anywhere else. That is to say not at all. The guys hadn't gotten out in a couple of days. On Tuesday the mother of all storms was predicted so we stayed in. We parked our cars up on a hill, got out candles and prepared our emergency radios and flashlights. What proceeded was an hour of wind and one of the lighter drizzling events we've ever witnessed. 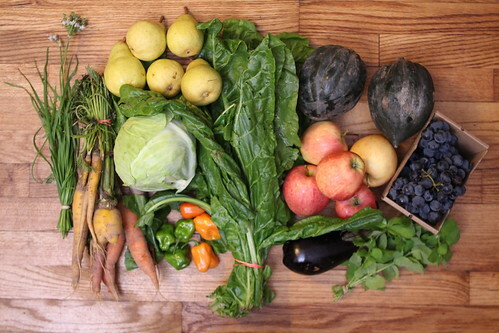 Today we got our weekly farm share. We got carrots, acorn squash, garlic chives, green cabbage, spinach, eggplant, mint, habaneros, Gala apples, Bartlett pears, and Concord grapes. 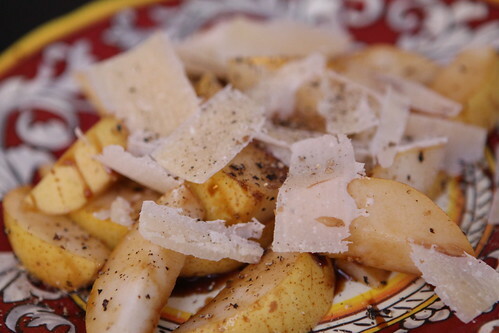 I started off by slicing up some of the farm pears with a little Parmigiano-Reggiano, balsamic glaze, and black pepper. 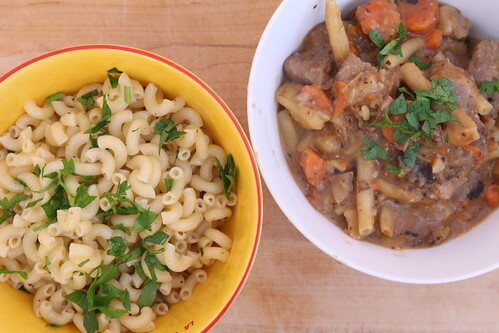 Jen made a lamb stew (or 'hodge podge' as she calls it) with onion, potato, carrot, and wax beans. I was in charge or watching it while Jen fed the babies and I sort of let it burn a little bit. The stew was good but it probably would have been a bit better without my inept supervision. 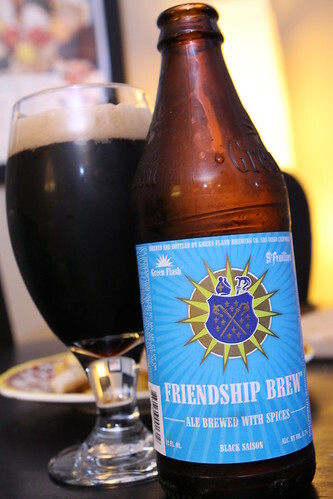 For beer I cracked open this Friendship Brew from Green Flash Brewing Co. in collaboration with Brasserie St-Feuillien in Belgium. I must have misread it because I thought it was just a light saison which Jen would have loved. As soon as I poured it out I saw there was something wrong and realized that I was an idiot. It clearly said "Black Saison" on the label. After tasting it I realized that Jen would not like it and, indeed, it was not my favorite offering form Green Flash or St. Feuillien. There was a very harsh bitterness to it like raw cacoa nibs. While a darker beer complemented in the stew well I would have cared for a less bitter beer. It almost tasted like it was a little burnt. I love both these breweries so I'm just hoping they get together and brew another beer soon that is a little more representative of how good their beers can be. 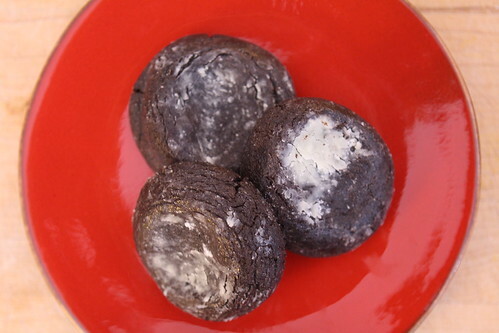 For dessert we had these chocolate crinkle cookies from Comanzo & Co. in Smithfield, Rhode Island. I only bought these because they were from right near where I grew up. Whenever possible I like to support small town Rhode Island. Even though I was doing this out of loyalty to my home state it also helped that these cookies were delicious. For all my peeps back home I'd highly recommend seeking them out. It's always good to see Rhode Island do something right. Labels: beer, Dessert, firsts, How'd we use it?, What'd we get?